This IBM® Redbooks® publication discusses the value proposition of cross-channel solutions and describes the IBM Retail Integration Framework Commerce Product Strategy solution and service-oriented architecture (SOA) as an enabler. In depth, this book describes cross-channel processes and cross-channel features and proposes scenarios and configurations to meet the challenges in a competitive environment. 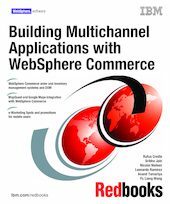 This book describes the latest features and techniques of IBM WebSphere® Commerce Version 7. In it, we present an overview of the WebSphere Commerce order and inventory management systems, the distributed order management (referred to as DOM throughout this book) integration framework, and a sample DOM integration scenario. We discuss the Madisons starter store (Web 2.0 storefront) and present a hands-on experience that integrates MapQuest with the WebSphere Commerce V7 Store Locator feature. We discuss how a merchant can use the mobile features that are included in WebSphere Commerce V7 to define e-Marketing Spots and promotion for mobile users. In addition, we demonstrate how to use Google Maps with the Store Locator feature on a mobile device. We include in this book an example about how to apply WebSphere Commerce features on a cross-channel solution as applied at the Easy Hogary Construccion home improvement retail company in South America. The scenario explains how to scale from an SOA store to a cross-channel business model.